I've never practiced with a mute. Oh sure, I own a couple, and I'll use them from time to time for a different sound or effect, but I just don't practice with one. Now, I know you're probably saying, "But my situation requires a mute... my wife... my kids... my neighbors..." Yes, I get that. Really I do. Thing is, my life probably isn't much different. That said, I still don't use a mute to practice. Am I just a big old meany that tells my family to stuff it when I'm practicing? No. I'm considerate, but I also have practice goals, and using a mute interferes with my own personal goals. See, for me, it's never been just about the notes. Let me reiterate: it's never been just about memorizing and playing back strings of notes. No, for me, it's always been about the whole thing - the three T's if you'll allow me to use that cliche (you know, Tone, Taste, Timing). It was never enough - even in the beginning - to be able to play a roll/tune/whatever. It had to sound right too. From day one I was concerned with tone (though listening to many older recordings I made along the way makes me wonder just what I was hearing back then). I was, then as I am now, concerned with dynamics. When I listened to my heroes on their recordings or live I could tell that while I might know every single note they played, there was more to it than just the notes. I knew it was the tone and dynamics. Practicing with a mute didn't allow me to learn that. So, you're asking, "Jim, just when or where do you practice?" I practice when the other people around me are awake and moving around. If someone is watching a movie, or studying, I don't practice. I always have the option of going to another room if I need to. I've also been known to practice in the evenings - even when people are asleep - but it's rare, and only if I'm tucked away somewhere in the house out of direct earshot of anyone that might be disturbed. Now, don't think I've not considered that maybe I'm lucky when it comes to practicing when I need to. However, as a kid, my parents never discouraged me from playing - ever. I was never told that I needed to be quieter, nor was I sent outside. I even remember on long road trips riding in the backseat of the car practicing my banjo. Maybe my folks were gluttons for punishment, or maybe they liked me enough to tolerate my playing. In college I practiced in my dorm room - never once did anyone complain. I got married in 1986, and I'm still married to the same - obviously patient - woman. She's never once indicated that maybe I should stop practicing. She understood from the very beginning that I'm a banjo player, and being such a thing requires a bit of effort. My son doesn't seem to mind either. Perhaps it's because he grew up around it? Finally, you may be wondering if I'm recommending that you shouldn't use a mute? Well, no, not really; you can use one if you want. I'm just suggesting that maybe the benefits of practicing without one outweigh the reasons to use one. 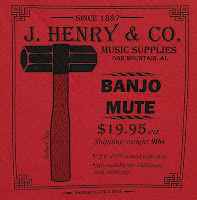 Are you ready to learn some old-time banjo?